At some point, we’ve all likely been told, “Sit up straight!” or “Don’t slouch!” As kids, most of us probably rolled our eyes at this timeless remark and then continued to slouch once the posture police left the room. If this sounds like you, hopefully, you didn’t spend too much of your life scoffing these words, because it turns out this is advice worth heeding. As an experienced team of doctors, chiropractors, and physical therapists striving to provide the people of Colorado Springs with comprehensive, all-natural medical care, we at Springs Integrated Health understand the importance of good posture. In today’s blog, we are going to discuss some of its advantages. Before we get too far, it’s important to first stop and explain exactly what posture is. When we say posture, we are referring to the body’s alignment and positioning with respect to the ever-present force of gravity. Regardless of whether we are sitting, standing, or lying down, gravity and our weight affect our body. By exhibiting good posture, you can ensure that your body evenly distributes these stressful forces so that no part is overstressed. 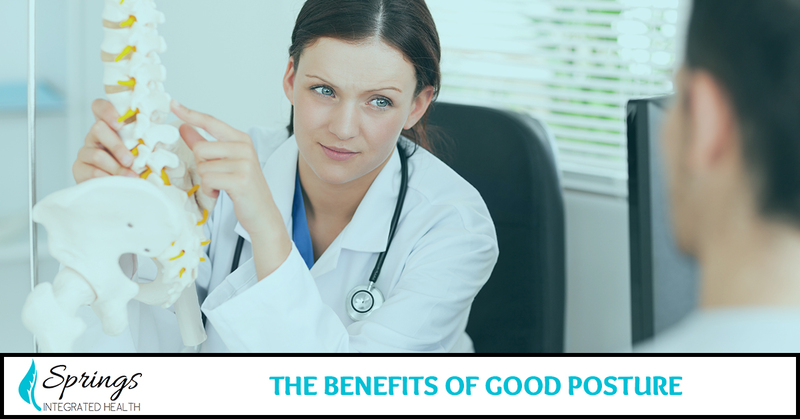 Below are some of the benefits of good posture. It’s no coincidence that when we go into a doctor’s office, the doctor tells us to sit up straight while listening to our lungs. When you are slumped over, your rib cage is slightly collapsed, limiting the room your lungs have to expand. Standing and sitting upright can make breathing more efficient and easier. When we slouch and hunch, we tighten up our abdomen and slightly compress our internal organs. Naturally, this can interfere with the natural flow and function of the digestive system. Some research has even suggested a link between habitual slouching and digestive problems, such as acid reflux, constipation, and even hernias. As experts in chiropractic care, we know the spine and central nervous system is responsible for controlling virtually every organ and cell of the body. It, therefore, only follows that protecting your spine and its function is of the utmost importance. When you exhibit bad posture, you don’t provide your back with adequate support, which can then add strain to the muscles and spine. Over time, this stress can change the spine and possibly constrict blood vessels and nerves, causing severe pain. For those who work in an office setting, where you are required to sit for an inordinate amount of time, it is crucial to display good posture. If you are having spine troubles and back pain, seek chiropractic care from your local chiropractor! When you exhibit proper posture, your bones and joints are aligned and can easily balance and support your body’s weight. When you have poor posture, your muscles, tendons, and ligaments have to work extra hard to support this same weight. Over time, this can lead to neck, hip, and back pain, as well as degenerative arthritis. Good posture reduces this risk, as well as the stress on ligaments holding joints together. It also helps your body work more efficiently and, therefore, use less energy and avoid muscle strain and pain. In today’s image-centric culture, it seems like everyone is looking for quick and easy ways to shed some pounds—or at least, create the illusion of being slimmer. Though you shouldn’t go as far as replacing exercising with regularly exhibiting good posture, it can give you a slimmer, younger look. Some report that by standing and sitting more erect, you can take three to five pounds off your appearance. Studies also show that physical posture makes people perceive you as being more authoritative and dominant. Not only does it make you seem more powerful and confident to others, but it also can improve how you feel about yourself. Perhaps this is the real reason why all our parents told us to “straighten up”—they were just looking out for our self-esteem. Whether or not your mother or whoever suggested you display good posture knew of all the implications of poor posture, it would suffice to say they were right. Proper posture creates less strain on your body, improves spine health, and can lead to better overall health and image. Remember, the first step toward breaking old habits is becoming aware of them and then taking deliberate, intentional, and consistent steps to change them. When trying to break the habit of slouching and hunching, aim to keep your body upright and balanced as often as possible. If you’re experiencing pain that is the result of poor posture or some unknown cause, don’t hesitate to contact our holistic wellness center. From stem cell therapy to physical therapy to chiropractic care, we provide the people of Colorado Springs with an array of integrated health modalities that help you achieve optimal well-being. View our services here, and contact us today!